Hello, hope everyone is enjoying their Saturday. We snuggled in today. Slept in and then just stayed put. Supposed to get really cold tonight. Forecast is snow most of next week, but then it is January and that's what we can expect here. Today's card is a Meljen image from Whimsy. I colored with copics. Cut it out with a Nestie die. Distressed the edges with distress ink. Papers are from the DCWV, Nana's Nursery stack. Lace doily is cut in half and tucked up along bottom edge of image. Border punch is Martha. Ribbon is from Michale's dollar bin. The sentiment stamp is one of the first stamps I bought years ago. Have a great rest of the weekend. Thanks for stopping by. Until later. Your card is sweet. I am starting to use digital images a bit and I must say I am enjoying it, especially the instant downloads! Hiya Sue, sorry I not been round in a while. Wanted to wish you a belated Happy New Year. 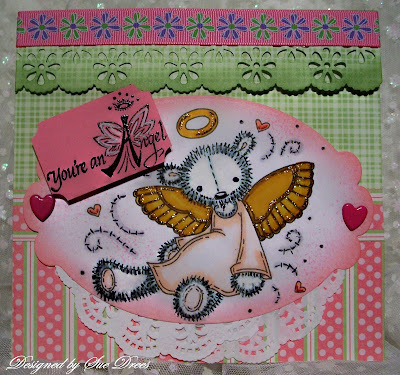 Love your card, cute image and fabby colourwork from you. Your pic of the falls at the top of your blog is JAW DROPPING!! Gonna show it to hubby! Hi Sue - Long time, no visit...sorry! Hope you are doing well and had a great Christnas and New Year. This card is fab and that cute image is adorable. Your header pic is amazing! Hubby thought it quite funny they decided to take the children for walk!!! This is one of my favorite digital images, Sue! Love the colors and papers that you used, beautiful card! Stay warm, my friend!